According to the Bulgarian legislation the Grey wolf (Canis Lupus L.) is a species which habitat should be protected with high priority, according to the provisions of the Natura 2000 network (species in Annex II of Biological Diversity Act with asterisk). The species in Bulgaria is not legally protected. It is included in Annex I of Hunting and Game Conservation Act and accordingly can be hunted all the year around. The Bulgarian wolf population suffered a severe decline in the last century, especially during 1950’s-1960’s, due to massive predator control (incl. bounties and nationally organized poisoning campaign with strychnine). As a result wolves almost got extinct and small groups survived only on the country’s border areas in Rhodope Mountains, Strandja Mountains and Kraishte region. The population started it’s recovery in early 1980’s after the use of strychnine has been prohibited. Nowadays this species inhabits all mountainous regions and most of the lowland forests. The governmentally organized “census” provides number of around 2000-2300 individuals but the data is gathered mainly by questionnaires instead of unified scientifically proved methods. That is why those numbers are considered to be overestimated. According to expert’s estimations the population does not exceed 1000-1200 individuals. Its distribution range covers over 25000 km2, which represents about 25% of the country’s territory. At the beginning of the 20th century the Brown bear was considered a pest species and bounties were paid for killed bears. As a result in 1930ties only less than 300 individuals remained. After the species was put under protection and starting from the 1950ties the population increased again as result of effective measures taken for preservation and limitation of the hunting pressure. In the 1980ties the communist government put the bear on a list of managed animals, for which hunting on national level was forbidden except for very few individuals that were shot per year by high ranked politicians and foreign trophy hunters from abroad. This offered this species a high protection level although being a game species. After the 90ties, after the change of the regime, intensive hunting and poaching increased again, which led the Ministry of Environment to ratify a decree that declared the species under protection, with exceptions for animals causing damages or being dangerous for humans. Since 2002 the Brown bear is a strictly protected species (included in Annex III of the Biological Diversity Act) and the species’ habitats should be protected with high priority and be included in the Natura 2000 network (species in Annex II of BDA with asterisk). Also here, exceptions are made only following the EU derogation rules for the removal of problem bears. The Bulgarian brown bear population is nowadays divided into 2 subpopulations with little or no contact between them – the Rilo-Rhodopean with about 300-500 individuals and the Central Balkan population with some 100-200 bears. 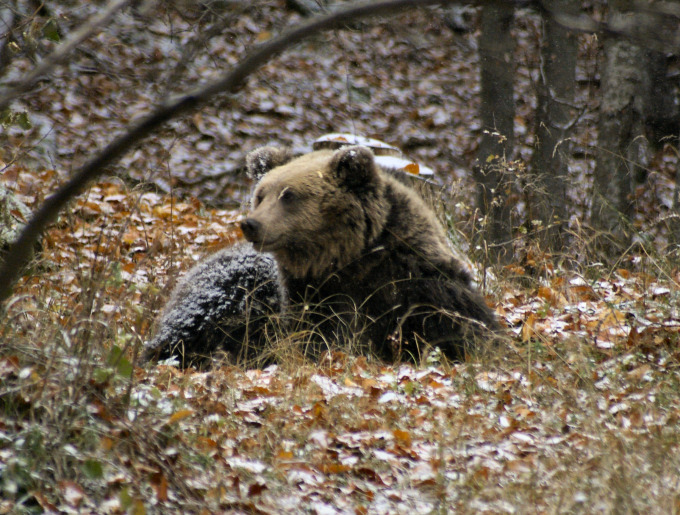 According to a research carried out by Balkani Wildlife Society, which included field work, the submission of questionnaires and population modelling bears are distributed on approximately 10.500 km2 of the country territory (about 10% of the country) and the population is estimated to be between 400-700 individuals. The official census of spring 2009 reported 1021 bears in the country. Similarly as for wolves, this census is not reliable and is considered overestimated by scientists and conservationists. Human dimension carried out by Balkani WS shows than inhabitants in bear and wolf areas have in general positive attitude towards bears but negative towards wolves. Due to the low density of wild ungulates (cause by illegal over-hunting) and not efficient protection of livestock, wolves often use anthropogenic food sources. Livestock is raised within the wolf habitats and damages caused by predators are frequent. As a consequence livestock breeders require from the hunting authorities to control (exterminate) wolves. Also, baiting with poisons occurs, although it is strictly illegal. Hunting authorities/societies blame wolves for the decreasing number of big game without considering the high level of poaching after the political changes in 1989. Due to the above mentioned reasons the wolf still is considered as a pest, can be hunted legally all the year around and a bounty for every shot animal is still paid. Regarding bears, only problem individuals can be hunted legally in exceptional cases. 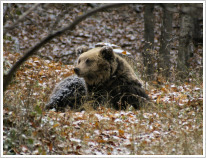 The recently accepted Brown Bear Action Plan for Bulgaria includes provisions to regulate hunting for management reasons, but these regulations have not been implemented yet. In fact, hunting permits are issued mainly for the purpose of hunting tourism instead of the proper treatment of problem bears. In Bulgaria people generally have a positive attitude towards bears, although also this species causes damages on livestock, apiaries and orchards. However, many bears are also killed illegally since this animal it is a rare and wanted trophy, sometimes they are accidentally killed on wild boar hunts, for fear or curiosity (especially in areas with no permanent presence). As a consequence of the economic hardship after the political changes in 1989, and due to a lack of efficient control there is very intensive logging and mushroom collecting. Due to this disturbance the habitats that could be effectively used by bears are avoided by these animals. Therefore they will have less natural food sources available, which drives them to seek for alternative high energy source of food such as easily available beehives and livestock. At the same time many ski resorts, sport facilities (ski slopes, lifts, golf courses etc. ), dam lakes, fenced areas for game breeding, motorways, etc. are planned or already existing in important bear habitats and corridor areas. All this together with the existing infrastructure creates fragmentation, which might highly endanger the bear population in the country. The calculated carrying capacity of Central Balkan habitat is less than 250 individuals and the subpopulation is almost completely isolated. Such population, if completely isolated, cannot survive on the long term.